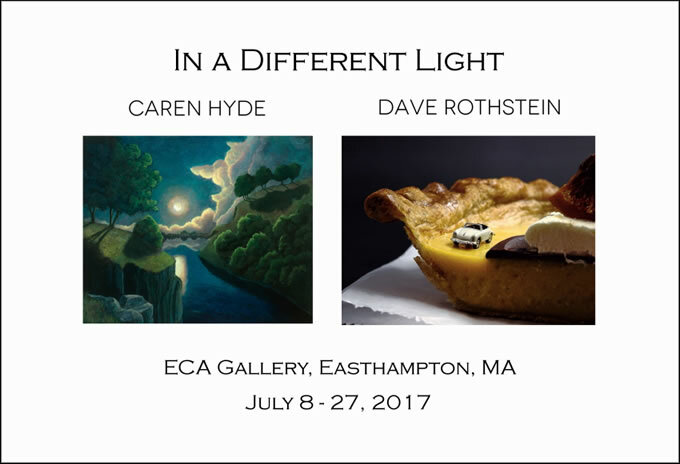 I’m excited to announce the opening reception for “In a Different Light”—paintings by Caren Hyde and photographs by Dave Rothstein—will occur during Easthampton’s Art Walk on July 8th from 5-8 p.m. Swing by to view the artwork and meet the artists at the Easthampton City Arts Gallery. My photographs feature miniature figurines enmeshed with locally-produced specialties created by those whose work doesn’t typically appear in galleries, but on our plates and in our glasses—the Valley’s talented farmers, chefs, bakers, brewers, vintners and frozen treat makers.￼￼￼ Miniatures distort our senses of space and place. In doing so, they allow us to view the subject matter with which they are paired…in a different light. Caren’s paintings depict twilight and illuminated night. Often thought of as a time of stillness, quiet and sleep, night is also a time of visual drama, when light may be sharply focused and shadows are deep and long. It is a time when details disappear and darkened objects merge with each other to create new forms. Imagination is ignited and fantasy may inform reality creating new narratives, a sense of the uncanny, a feeling of disquietude or mystery.